The Marriott Merlin Beach Resort is almost in Patong Beach, but not quite. 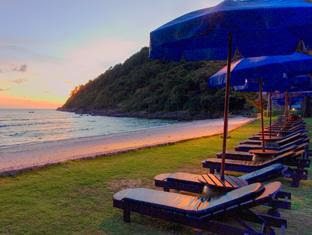 The location is off a side road to the South end of Patong, past the Baan Yin Dee Boutique Resort and heading towards Paradise Beach. It's easy enough to find, but not too many people head this way. 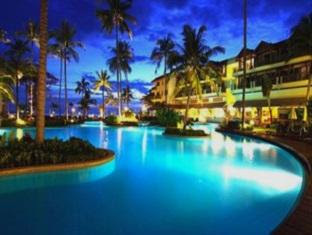 This is an area we like and I have already recommended the Tri Trang Beach Resort on this blog. I just decided today to blog the Merlin Beach Resort, as a customer came in to book diving and was raving about the place. It IS a big resort, with more than 400 rooms and does get large travel agent bookings, yet due to it's secluded location does not feel like part of the main tourist scene. The resort has several restaurants, tennis courts, 3 pools, a spa, a gym, a beauty salon - all that you'd expect from a quality resort. But the attraction for me (as usual) is the location - Merlin Beach Resort is on it's own beach - which they say is called Tri Trang Beach, although that is also the name of the beach where you find nearby Tri Trang beach resort. The Merlin Beach faces south, the Tri Trang Beach resort faces North. The 2 hotels are not on the same beach... But hey, it's a private beach, located near Patong (near enough to get there in 10 minutes, but far enough to be very quiet) - great location.